Slice the bacon into 1 inch pieces and put into a large skillet over medium heat. Cook until it is just turning brown and most of the fat is rendered out. Using a slotted spoon, move the bacon to the slow cooker. Trim the ends off of each bunch of greens and separate the leaves. Collard greens are often very sandy and require a good wash. Put as many of the leaves in the sink as will fit and fill with water. Swish the greens around and then rinse each leaf again under running water or if you have a double sink, dunk them again in more water. Lay each leaf flat on a cutting board and with the tip of a sharp knife, cut the entire stem out. Cut the leaves into large bite sized pieces. When you have two bunches of greens ready, heat an 8-quart stock pot over medium heat. Rinse the chopped greens one more time and put into the stock pot. You want some water still left on the greens to help them wilt down faster. Cover the pot and let cook about 5 minutes, stir and cover again for another 2-3 minutes. Stir again and if the greens have shrunk by more than half, you can put them in the slow cooker. Repeat with the next two bunches of greens. Once the greens and bacon are in the slow cooker, add the vinegar, crushed red pepper, water, salt and pepper. Cook on low for 10 hours. Taste and adjust the salt to your liking. Serve with hot sauce or hot pepper vinegar. 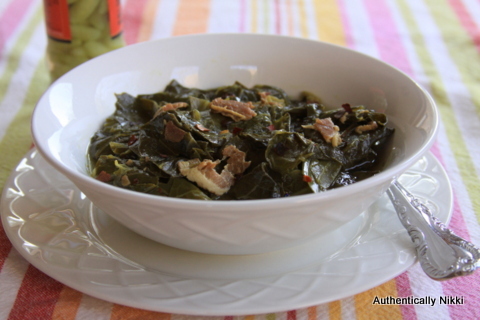 This entry was posted in Side Dishes and tagged collard greens, slow cooker by authenticallynikki. Bookmark the permalink.